Bake a sheet cake the size that you need. With an icing filled bag and round tip, size #5, draw Turk on the top of the cake. Cut away the cake from Turk’s outline. Make a light gray icing and use star tip, size #18 to cover the face area, ears and tummy. Make a medium gray icing and using the same size star tip, size #18, cover the rest of the head, the back and leg. Now make a little darker gray icing and use star tip, size #18 and cover the front legs. Use the light gray icing and round tip, size #5 and make toes on the feet. Use white icing and star tip, size #18, and cover the pupils in the eyes. 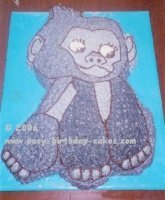 Change the tip to round tip, size #5 (still using the black icing) and outline the entire gorilla making sure you add all of Turk’s facial features (as shown in the picture).